Scaling a boulder is a bit like putting together a puzzle. If I grab that groove up there with my right hand, where will my left hand go? I can place my left foot on that crag, but then I’ll have to find a spot for my right foot. Once I’ve gotten resituated, I’ll take a look at the puzzle again, figuring out my next move as I jigsaw my way up. Climbers call these bouldering routes “problems.” With the right skills, nearly every problem can be solved. But perhaps not the one I’m attempting, at least not with my skills. I’m about halfway up a twenty-foot boulder striped with natural creases that make it easier to climb, at least in theory. 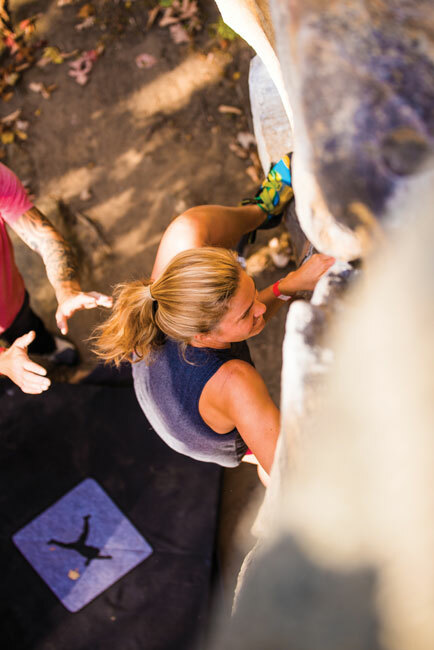 Here in Little Rock City, a legendary boulder field outside Chattanooga, climbers routinely tackle rocks that are much smoother, taller, and steeper. But even if my boulder of choice is a totally navigable runt, I’m hanging on to the side of it with shaking legs and no clue how I’m going to get up or down. I’ve never climbed a boulder before. Shoot, it’s been three decades since I’ve climbed a tree. But I’m in the company of experts who have offered to teach me, a spirited group eager to show off some of the outdoor activities Chattanooga offers. Mountain biking at Stringers Ridge is next, and I’ll also kayak and hike before I return home to Atlanta. If the winds remain calm, I’ll hang glide as well—which, at this moment, sounds relaxing compared with scaling a boulder without a rope. A voice from the ground calls for me to reach for an edge in the rock far to my right. He must think I’m a spider monkey. I spot a small pocket that’s a little closer, and before I can talk myself out of it, I grab it with my right hand. Hoots erupt from below. Piece by tiny piece, I put the puzzle together. Ten minutes later, I hoist myself over the top. I’m sweating. I’m laughing. I’m surveying Little Rock City like I’m its new queen. My hands are red and my knee is scraped, but that’s just part of the initiation. I’m a climber now, spending the morning with a climbing community, and looking out over the rocky paradise that is Chattanooga. 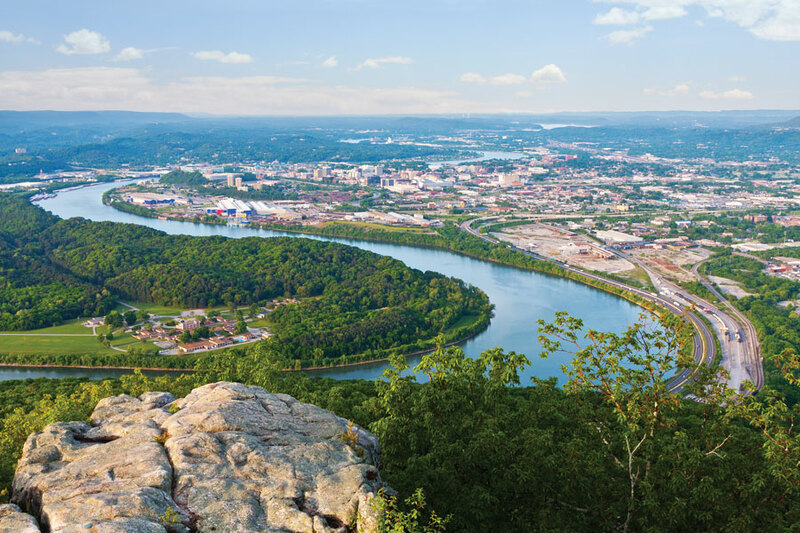 Chattanooga is known as an outdoorsman’s mecca. This reputation is not accidental, nor is it long-held. In 1969, Walter Cronkite announced during the evening news that Chattanooga was the “dirtiest city in America.” And indeed, it was: He was citing a just-published study by the Environmental Protection Agency that showed that Chattanooga had the worst air quality in the country. So bad was the smog, some people drove with their headlights on during the day. The public shaming was a wakeup call for residents, who banded together to create antipollution task forces and lobby for stricter regulations for manufacturing plants. 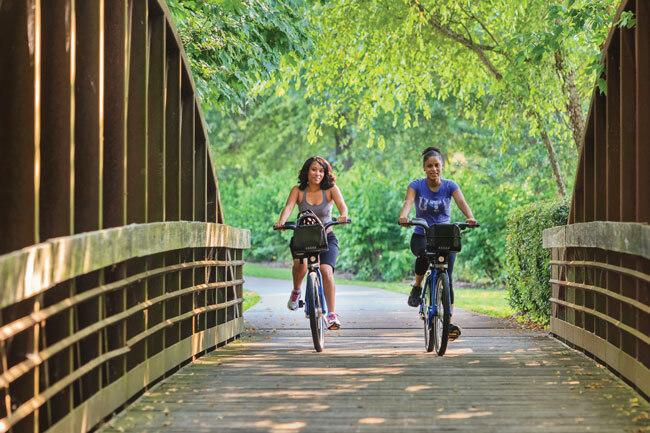 In the eighties, after the smog cleared, the River City finally created its own Riverwalk, a thirteen-mile path for running, biking, or strolling between pocket parks along the Tennessee River. In 1992, the local transportation authority introduced a fleet of electric, emission-free buses that offers free rides around town, and in 2009, it helped launch Bike Chattanooga, which provides 300 rental bikes at thirty-three docking stations dotting the city. But perhaps no one did more to flip Chattanooga’s reputation from grimy to green than U.S. Senator Bob Corker. The city’s mayor from 2001 to 2005, he announced midway through his term that he wanted to see Chattanooga market itself as the “Boulder of the East.” Both were midsized cities with easy access to rivers and mountains; both offered ample opportunities for hiking, biking, kayaking, climbing, and rafting. But until then, only one had capitalized on its assets. “Although our community’s location makes us a great outdoor destination, we have not really made the most of these outdoor advantages,” Corker said via press release at the time. In 2004, he unveiled the Outdoor Chattanooga Initiative, which promotes the city’s outdoor recreation options to visitors and locals. From its headquarters in Chattanooga’s NorthShore district, Outdoor Chattanooga provides everything from guided kayaking trips to introductory mountain bike lessons, along with rock climbing primers and a course on riding your bike in an urban setting. So successful is Outdoor Chattanooga, two similar programs—Outdoor Knoxville and Outdoor Nashville—are modeled after it. And thanks in no small part to Outdoor Chattanooga’s efforts, the city has become a must-visit destination for outdoor adventurers. 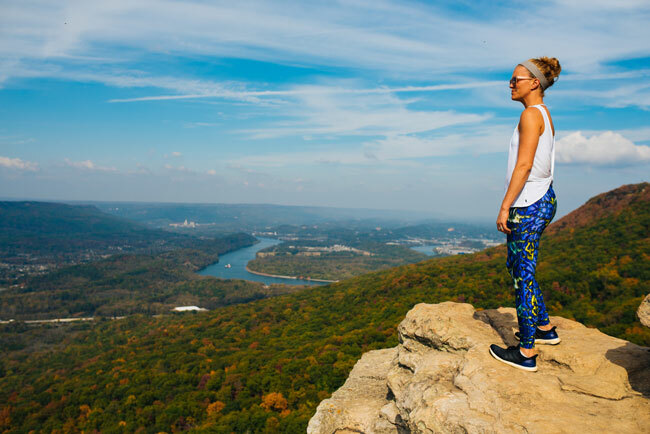 Last year, the University of Tennessee Chattanooga published a study showing that recreational climbing alone spurs nearly 17,000 leisure trips to Chattanooga a year, which in turn helps fuel the sport’s seven-million-dollar annual impact on the town. And don’t assume all those vacationers come from drive markets. According to Dan Rose, cofounder of Chattanooga’s Crash Pad hostel for climbers, a surprising number of his guests hail from, of all places, Colorado. Kayaking around Maclellan Sanctuary, a sliver of an island owned by the Chattanooga Audubon Society, I might as well be circling a miniature Eden. Great blue herons spread their ruffled wings. Trees sag under the weight of tangled osprey nests. A river otter peeks up from his swim in the Tennessee River. But this is no remote paradise—Maclellan Sanctuary is situated in the heart of downtown Chattanooga. In the kayak next to me is Zach Bopp, a recreation specialist with Outdoor Chattanooga. 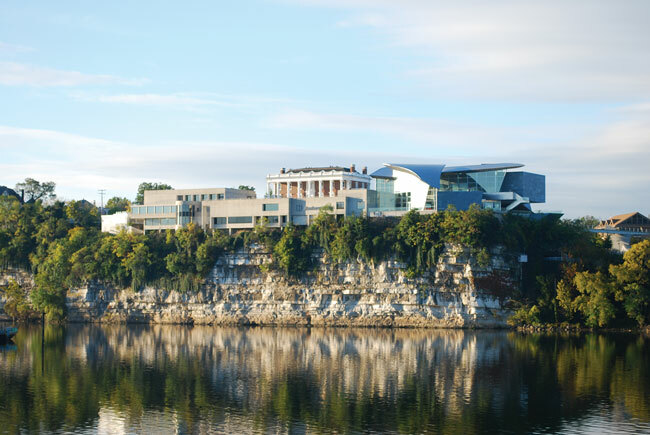 He points downstream to Hunter Museum of Art, whose impressive steel-and-glass building overlooks the river. Then he tells me to look at the limestone cliff on which the museum is perched. On weekends, he says, he’ll sometimes climb across that cliff horizontally, a technique called traverse climbing. When he’s tired, he’ll simply drop into the river. “These days, it’s clean,” he says. We paddle beneath Walnut Street Bridge, which stretches from downtown to the NorthShore and holds the distinction of being the world’s longest pedestrian bridge. We’re moving with the current, and I tighten my grip on my paddle to maintain control. A family crossing the bridge some 140 feet above us pauses to wave. We wave back. Cannon water fountains in front of the Tennessee Aquarium shoot white arcs of water in our direction, as if offering a greeting of their own. We near the Southern Belle, Chattanooga’s famous steamboat, then take a right into Coolidge Park. After nosing onto the grass, we wobble out of our kayaks and onto dry land. 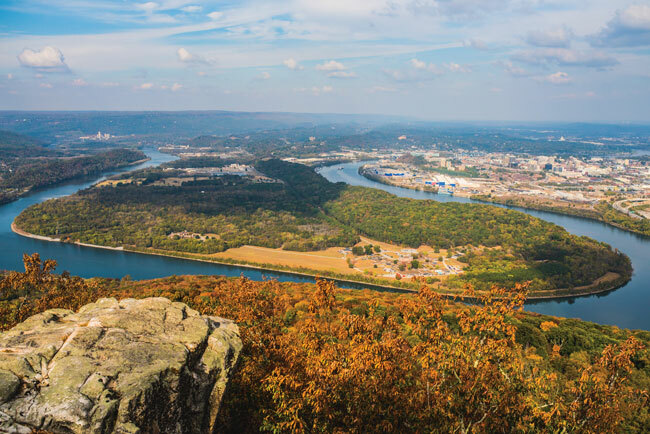 It’s time for me to hike Bluff Trail on Lookout Mountain, then put myself through one last test: hang gliding over Chattanooga’s Lookout Valley. I’m dangling in a prone position three feet above a grassy field, strapped beneath a parked hang glider. Harnessed next to me is Joe, the instructor to whom I’m entrusting my life. Our glider is hooked by a rope to an ultralight plane, which will soon tow us 2,000 feet into the air, then let us go. With no engine to keep us aloft, we’ll start to descend, our only hope for buoyancy resting in pockets of rising thermal air. I tell myself I’m not afraid. Lookout Mountain Hang Gliding is the nation’s largest hang-gliding school, and they have done thousands of these flights over the last twenty years. I’ve gone skydiving and lived to tell about it. Heck, I just climbed a frigging boulder. 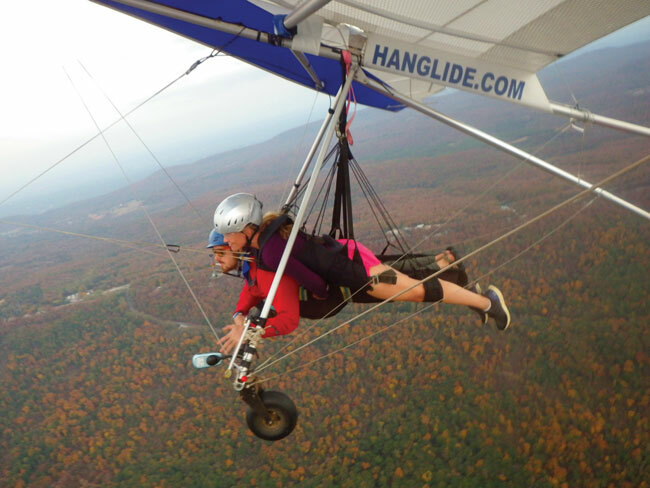 I can hang glide and not freak out. Or maybe I can’t. The plane is taking off and we’re moving behind it, our wheels levitating as we pick up speed. I can’t decide if I should close my eyes or keep them open. Do I shut out the world and pretend I’m somewhere else or mentally try to fly this thing? We rise from the valley into the sky, the field below morphing into a green rectangle, which soon shrinks into a single piece in a giant geometric puzzle. I tell myself to settle down and take in the view. A hawk soars below us. He makes it seem so natural. Stone Fort, better known as Little Rock City, makes many a climber’s bucket list. Stringers Ridge, a ninety-two-acre wilderness located within Chattanooga city limits, features miles of singletrack. 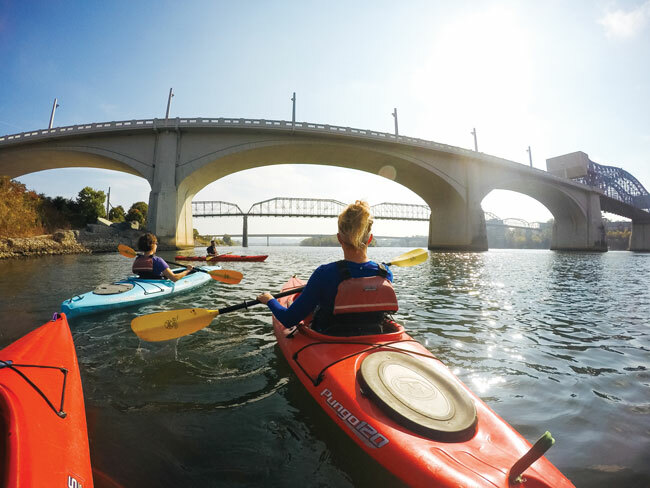 The Tennessee River flows through downtown Chattanooga, offering a terrific urban paddling experience. 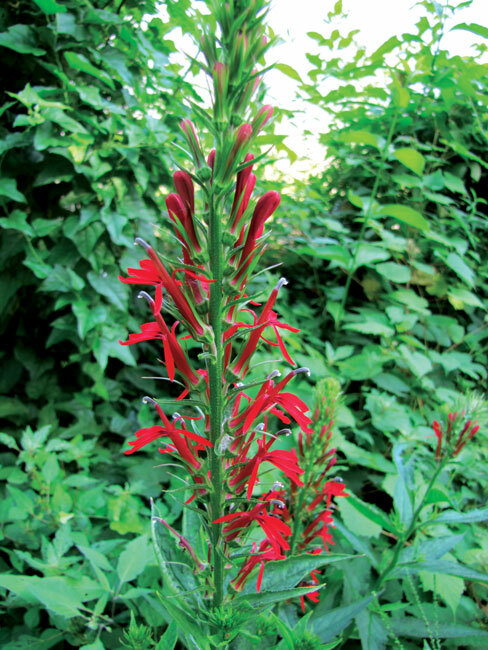 Bluff Trail is perfect for beginners or families and showcases spectacular views of Lookout Valley from Sunset Rock. The Ocoee River, with its Class III and IV white-water rapids, offers a thrilling ride and picturesque scenery within a giant gorge. Lookout Mountain Flight Park, located at the base of its namesake peak, is home to the largest hang-gliding school in the country. Information on all of Chattanooga’s outdoor activities can be found at outdoorchattanooga.com.